When a person loses or is at risk to lose the ability to function, whether due to an injury, medical condition, chronic disease, or merely to the aging process, rehabilitation may be needed to regain these functions and enhance the individual’s independence. A variety of factors can influence the goals of rehabilitation, including the patient’s age and the roles, as well as cultural and environmental factors. For instance, a child who was born with cerebral palsy may need physical, occupational, and speech therapy to reach the developmental milestones for children of his or her age. By contrast, an adult recovering from a long hospital stay may need respiratory therapy to improve respiratory capacity and physical therapy to strengthen leg muscles such that the individual is able to walk safely to work. Both the type and intensity of rehabilitation services required and the health and rehabilitation professionals needed to provide rehabilitation care differ depending on the individual. 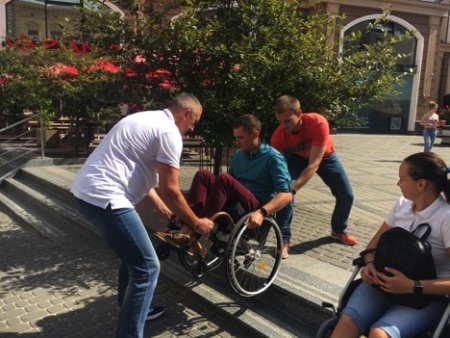 Personal mobility has been recognized as a human right , and the ability to move independently in one’s environment has been established as a major goal of rehabilitation. Personal mobility does not refer merely to the ability to walk, but to the ability to move in the way and time one chooses. As a result, wheelchair provision is an important aspect of rehabilitation services. An appropriate wheelchair not only enables a mobility-impaired person to get to the bathroom in his home, but to be more socially included in his community. It can also facilitate greater access to complimentary healthcare services that further reinforce rehabilitation goals. 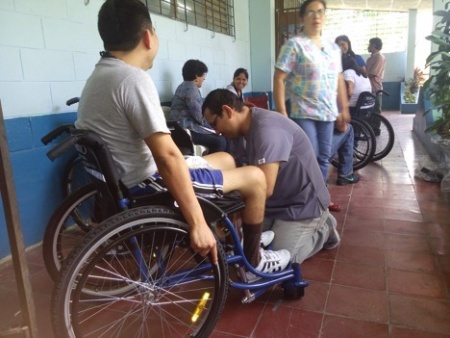 Provide wheelchair for trials and simulations either at home or in the community or provision center2. Assist the seating and mobility expert with product fitting and delivery if needed. Document training needs and outcome measures. 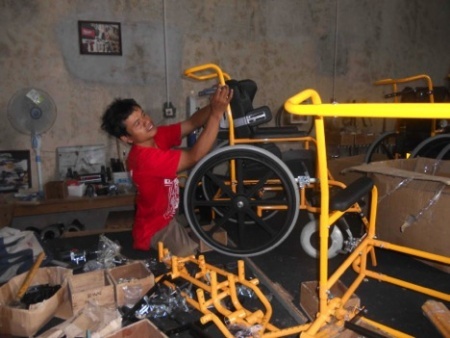 Provide training on the wheelchair’s specific functions or operations. Link to other Wheelchair Skills Training sources. Follow-up clinical and technical support should be made available to all users to ensure that their wheelchairs continue to be appropriate for their needs. Providers should arrange, coordinate, and/or refer the user to other healthcare and rehabilitation specialists as needed, and further user training and maintenance and repair support should be made available. Reassess the user to begin the wheelchair provision process again if needed. Assist in reassessing users for new wheelchairs and providing wheelchair recommendations as needed. If the wheelchair user presents with incontinence issues, he or she should be referred to the proper specialist as incontinence can place the user at risk for the development of a pressure sore. The most appropriate professional to provide guidance on managing bladder issues is a urologist. The urologist should assess the user and provide him or her with an appropriate treatment and management plan for the incontinence issues. The goal of bladder management is to achieve and maintain a functional bladder-drainage mechanism and prevent infections of the genitourinary system. For more information in this topic refer to the Consortium for Spinal Cord Medicine’s Clinical Practice Guideline: Bladder Management for Adults with Spinal Cord Injury. Generally speaking, the collaborative activities of a multidisciplinary team should include: (i) identifying and addressing the risk factors for pressure ulcers; (ii) establishing a prevention program and treatment; and (iii) educating users about how to inspect and care for the skin and prevent skin breakdown. For more information in this topic refer to the Consortium for Spinal Cord Medicine’s Clinical Practice Guideline: Pressure Ulcer Prevention and Treatment following Spinal Cord Injury and the National Pressure Ulcer Advisory Panel’s Quick Reference Guide on the Prevention and Treatment of Pressure Ulcers. Psychosocial factors such as self-esteem, motivation to use technology, emotional status, coping strategies, current age and age at disability onset, and social stereotypes, among others, can influence wheelchair use. A person with a psychosocial issue may be more reluctant to use a wheelchair. In cases such as these, the user would likely benefit from a referral for psychological support or peer counseling. Physical and occupational therapists play an important role within the rehabilitation team as they can assist wheelchair users to maintain or further develop their physical condition to prevent secondary injuries, increase function, avoid contractures, and preserve upper extremity function; and learn new propulsion, transfer, and pressure-relieving techniques. Therapists can also instruct family members and other caregivers on appropriate techniques to for wheelchair pushing and assisted transfers. Experienced wheelchair users often know what will be “an appropriate wheelchair” for them. If they have used a wheelchair already, they will have ideas about what works for them, and what they would like to change. Wheelchair users who have not used a wheelchair before will need more information. Wheelchair user should be an equal participant on the wheelchair seating team. ↑ 1.0 1.1 Momsen A, Rassmussen J, Nielse C, Iversen M, Lund H. Multidisciplinary team care in rehabilitation: an overview of reviews. Journal of Rehabilitation Medicine. 2012;44(11):901-12. ↑ 2.0 2.1 WHO Standards for Prosthetics and Orthotics. Geneva: World Health Organization; 2017. ↑ 4.0 4.1 Convention on the Rights of Persons with Disabilities. New York, United Nations (https://www.un.org/development/desa/disabilities/convention-on-the-rights-of-persons-with-disabilities/convention-on-the-rights-of-persons-with-disabilities-2.html, accessed 17 July 2018). ↑ Marr C, Seasman A, Bushop N., Managing the Patient with Osteogenesis Imperfecta: A Multidisciplinary Approach. Journal of Multidisciplinary Healthcare. 2017; 10: 145–155. ↑ 6.00 6.01 6.02 6.03 6.04 6.05 6.06 6.07 6.08 6.09 6.10 6.11 6.12 World Health Organization; Guidelines on the Provision of Manual Wheelchairs in Less-resourced Settings. Geneva: World Health Organization; 2008. ↑ 7.0 7.1 7.2 7.3 7.4 7.5 RESNA Wheelchair Service Provision Guide. Arlington, VA: RESNA; 2011. ↑ MacPhee A, Kirby L, Coolen A, Smith C, McLeod D, Dupuis D. Wheelchair Skills Training Program: A Randomized Clinical Trial of Wheelchair Users Undergoing Initial Rehabilitation. Archives of Physical Medicine and Rehabilitation. 2004; 85(1): 41-50. ↑ Consortium for Spinal Cord Medicine. PVA Clinical Practice Guideline: Bladder Management for Adults with Spinal Cord Injury. Washington, DC; 2006. ↑ 11.0 11.1 Consortium for Spinal Cord Medicine. PVA Clinical Practice Guideline: Neurogenic Bowel Management in Adults with Spinal Cord Injury. Washington, DC; 1998. ↑ 12.0 12.1 12.2 Consortium for Spinal Cord Medicine. PVAClinical Practice Guideline: Pressure Ulcer Prevention and Treatment following Spinal Cord Injury. Second Edition.Washington, DC;2014. ↑ 13.0 13.1 National Pressure Ulcer Advisory Panel, European Pressure Ulcer Advisory Panel and Pan Pacific Pressure Injury Alliance. Prevention and Treatment of Pressure Ulcers: Quick Reference Guide. Emily Haesler (Ed.). Cambridge Media: Osborne Park, Western Australia; 2014. ↑ Scherer M, Sax C, Vanbiervliet A, Cushman L, Scherer J. Predictors of Assistive Technology Use: The importance of Personal and Psychosocial Factors. Disability and Rehabilitation. 2005; 27(21):1321-1331. ↑ 15.0 15.1 Thompson A, JarrettL, Lockley L, Marsden J, Stevenson V. Clinical Management of Spasticity. J Neurol Neurosurg Psychiatry. 2005; 76: 459-463.